Figure 1. Blisters at different stages on the patient’s lower leg. Figure 2. Skin biopsy demonstrating a tense subepidermal blister with superficial and deep dermal inflammation. Over a two-week period, a 23-year-old woman developed blisters over her limbs. The blisters commenced as erythematous papules. There were asynchronous lesions present at different stages of evolution (Figure 1). The differential diagnosis of itchy blisters includes the following lesions. 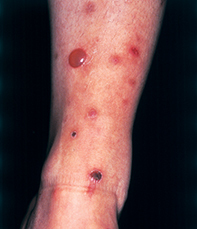 Bullous pemphigoid often presents as widespread tense blisters that are preceded by urticated erythematous lesions. The blisters are usually not confined to the acral areas and they often coalesce. Skin immunofluorescence, demonstrating linear deposits of IgG and C3 at the basement membrane zone, is required for definite diagnosis. Circulating bullous pemphigoid antibodies can be detected by indirect immunofluorescence using normal skin sections or by ELISA testing using bullous pemphigoid antigens. Bullous impetigo may be localised to follicular orifices, but it is usually pustular and the blisters readily break to form crusts. Skin biopsy shows superficial blisters localised beneath the stratum corneum. Staphylococcus aureus or streptococci are usually readily cultured. Erythema multiforme may present as acral blisters and often involves the palms and soles or the mucous membranes. Early lesions have a targetoid appearance. 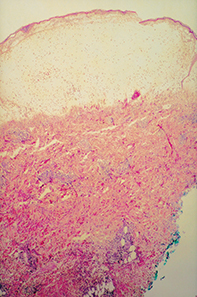 Skin biopsy shows focal epidermal necrosis with lymphocytes. Eosinophils are uncommon. Insect bites are the correct diagnosis in this case. They present as a papular urticaria with erythematous papules and a superimposed vesicle that is often excoriated. Skin biopsy showed a large subepidermal blister containing strands of fibrin. The underlying dermis had superficial and deep perivascular and interstitial lymphocytes and eosinophils (Figure 2). Blisters are seen more frequently in children or in individuals who have not been previously exposed to the local insects. Insect bite reactions are usually self-limited as long as exposure has ceased. Symptomatic relief for the intense itching may be provided by topical corticosteroid creams, 0.25% menthol in a cream or lotion base, topical anaesthetic or antihistamine creams used for a limited period. Both DEET (N,N-diethyl-m-toluamide or N,N-diethyl-3-methylbenzamide) or permethrin are effective insect repellents. Insect bites characteristically appear as grouped, often asymmetrical, highly pruritic blisters at various stages of evolution. This article was first published in Medicine Today in March 2003. It was reviewed and updated in November 2012.